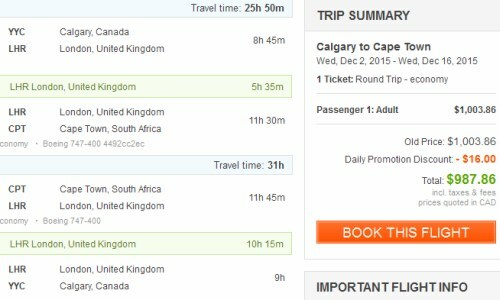 It's certainly not every day that there are flights between Calgary and South Africa for under $1000 roundtrip including taxes. Available dates look pretty limited, but there are some 2 week date combinations. The weather should be warm (but not too hot) between Oct and Dec. It might be a bit windy, but that's Cape Town. The flights are with British Airways between Calgary and London, UK - and with Iberia between London and Cape Town. For live discussion of this deal, or to get some amazing travel advice (to anywhere) from 13,170 fellow travelers in Calgary, join us in the YYC Deals Facebook Group. calgary, yyc, flight deals, africa, south africa, southern africa, british airways, cape town, cpt and iberia. One Response to "Calgary to Cape Town, South Africa - $987 roundtrip including taxes"
Thank you! Tickets are booked and I'll be off to see South Africa in the fall!